Join Ragnar, Floki, Bjorn and Lagertha and go pillaging for treasure in Vikings. Based on the hit TV show, this 5 reel, 243 ways to win video slot has been created by Scandi developer NetEnt and comes with high-end design and some innovative extras. Hotspots can transform multiple Viking symbols into the same one while the Shield Wall morphs into mystery symbol. The main bonus round offers 7 free spins on a 7 reel, 78,125 ways to win machine. Set sail on your PC, tablet or mobile from between 20p and £100 per spin. The design here is as high-end as you’d expect from a themed video slot from NetEnt. With mountains shrouded in mist in the background, you’ll see metal royal values spinning around the reels alongside 4 higher value Vikings Ragnar, Floki, Bjorn and Lagertha). It all comes together very nicely. Vikings isn’t just a good-looking game though as there are plenty of extras to get stuck into here too. Hotspot feature – 1 segment of the reels is designated as the Hotspot (reel 3). Land a fully stacked Viking character symbol in the Hotspot and all the other Viking symbols on view on that spin will all transform into the same symbol as the stacked Viking. A new payout consideration is then made. This payout is done scatter style so the symbols don’t have to be on adjoining reels to create a winner. This can lead to wins of 243 times your total bet. Shield Wall feature – a cluster of shields can appear at random on any spin. These symbols then morph into the same mystery symbol and a new payout calculation is made. This can hit in both the base game and the Raid Spins feature (more on this below). Raid Spins feature – the feature is activated by landing 3 Raid Spin scatters on the same spin. Your reward is 7 free spins on an expanded reel set. The 7 reels and 5 rows combine to offer 78,125 ways to win! The number of Hotspot areas increases from 1 to 3 boosting your chances of landing the Hotspot feature. Landing 27 matching Viking here offers a scatter payout of some 10,000 times your total bet! 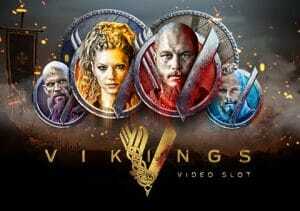 We had high hopes then we heard that NetEnt were doing a Vikings video slot and we’ve not been disappointed. The sound and visuals are terrific and there’s plenty of variety on offer from the gameplay. The highlight is certainly the Raid Spins feature where the multiple Hotspots can combine to potentially exciting effect. The TV version of Vikings has been a global smash. This video slot version is a quality adaptation and is well worth a spin whether or not you’re a fan of the show. NetEnt has come up trumps again – skol!